Current methods for producing graphene are expensive, time-consuming, chemically harsh, multi-step processes. Conversely, Grafoid’s graphene production process is a one-step, environmentally friendly method that extracts graphene directly from graphite ore. This process has the potential to position Grafoid as the lowest-cost producer and allows for mass production of functional graphene on a scalable basis. Most importantly, it may change the economics of graphene, allowing for widespread commercial adoption. As a result of Grafoid’s accomplishments, cost may no longer be a prohibitive factor in the development of graphene applications. Grafoid brings product, process and expertise to develop new graphene applications. Grafoid has invested in a revolutionary process to extract high quality, few layer graphene directly from graphite ore without going through harsh extraction processes that damage graphene’s unique characteristics. The greatest challenge in commercializing graphene is how to produce high-quality material, on a large scale at low cost, and in a reproducible manner. Grafoid has successfully overcome these challenges with the MesoGraf™ production process. Determined that the science works – MesoGraf™ graphene is now being produced on a scalable production basis and the quality has been independently characterized and validated by major corporations, academic institutions and industrial partners. In testing market acceptance, Grafoid has proven significant market potential. Keen interest has been shown from joint venture partners and Grafoid is currently involved in more than 17 joint venture graphene application development projects. Grafoid is partnered with publicly traded Focus Graphite Inc. (TSX-V: FMS | OTCQX: FCSMF | FSE: FKC), one of the premier graphite development companies in the world and owner of the ultra-high-grade, Lac Knife graphite deposit in Québec, Canada. While Grafoid’s process works with any graphite source, having long-term security of supply is critical with a strategic mineral. Grafoid is partnering with leading universities, research laboratories and blue-chip corporations in graphene application development. Grafoid and its partners remain in control of application development. Grafoid has launched a global platform consisting of Grafoid Inc., Focus Graphite Inc., and Graphite Zero Pte Ltd.– to deliver a mine-to-market, scalable suite of MesoGraf™ graphene products. 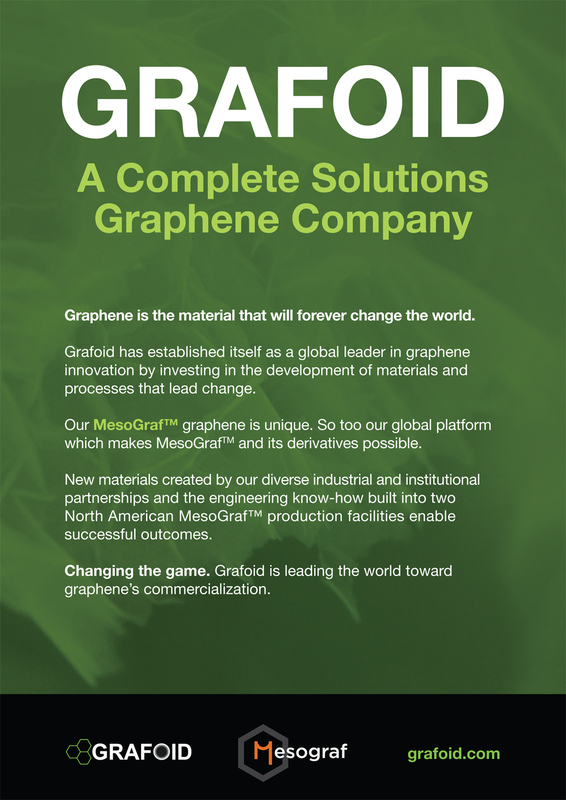 Grafoid employs a two-track process to lead the way — developing a global standard in graphene production through MesoGraf™ and challenging the competition in application development. Seasoned corporate leaders in public start-ups join key scientific and inventor talent in graphene production. Grafoid is a complete solutions graphene company — a standalone in the world — and is potentially one of the purest ways to invest in the coming Graphene Revolution. In addition to pilot plant scale production and R&D facilities in Singapore, Grafoid now hosts MesoGraf’s laboratories and production facilities at Queen’s University’s Innovation Park, in Kingston, Ontario, Canada and, later this year, at its U.S. facilities in New Jersey. 1. Through royalty revenues for the use of the commercialization technologies that are being developed by Grafoid and its partners. as well as ongoing royalty payments. 3. Selling MesoGraf™ product to joint venture partners. With multiple patents already filed, Grafoid is currently engaged in the development of numerous graphene joint ventures globally, in the areas of renewable energy and portable energy storage, oil-spill recovery, water desalination and purification, advanced polymer materials, bio-medicine, thermal dispersion technologies, coatings, 3D printing materials, and a number of classified material development projects. Due to reasons of commercial confidentiality, Grafoid is prevented from disclosing many of its ongoing commercial, industrial and military research and development projects. Please see Grafoid’s Partners page for details of the Company’s announced partnerships. 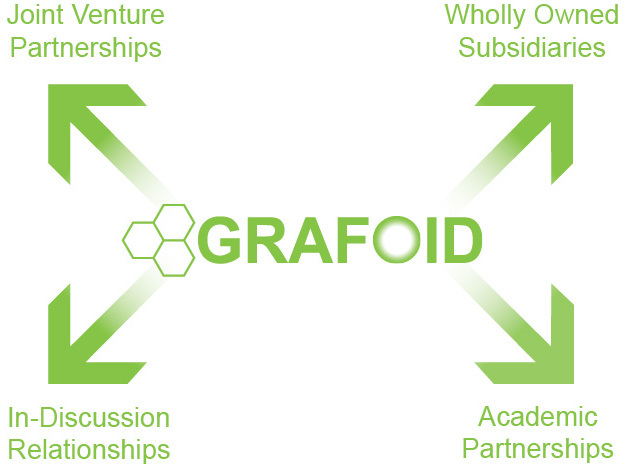 With a world-class resource, a game-changing proven technology, industry-leading scientific talent, and a plethora of sophisticated joint venture partnerships, Grafoid is a standalone in the graphene world. Grafoid’s business model is unique. The Company’s corporate strategy, coupled with Grafoid’s vertically integrated, managed supply chain brings business efficiencies and ultimately higher operating margins. Grafoid brings world-leading expertise in graphene, resolves scalability issues, tailors MesoGraf™ high-energy density graphene for unique applications, and provides solutions for achieving long-term success.